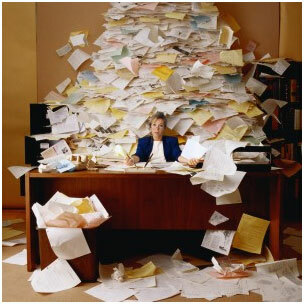 Does your desk look like this on a regular basis? Do you feel at the end of the day you were busy, but didn’t really accomplish anything you wanted to? Follow these five steps to simplify your life and prioritize your time. Everyone is only given 24 hours in a day – let’s help you find a way to use them effectively. 1) Grab a sheet of paper and a pen. Prepare for a brain dump. That’s right. Right down every single thing that comes to mind that you need to do yesterday, today, tomorrow, someday, etc. All those pesky post-it notes need to get thrown away and added to this list too. De-clutter your desk to prevent sensory overload. Getting all this on paper prevents it from clogging up your brain and preoccupying yourself with it. @home – yes, get this off your brain too. Things like give the dog a bath, unclog the shower drain can and should be on here too if they are taking up your mental capacity. @boss- what topics do you need to cover with your boss or maybe a certain employee next time you see them. Christmas gifts- yes, I already have this one too, but if a good idea comes to me, I have to write it down or I lose it and am stuck on Dec. 23 rd trying to come up with an idea. Come up with many more of your own to help you categorize your life! Then only focus on what’s needed. 3) Create a category for each day of the week. Only assign five things to each day. Too often we try to bite off more than we can humanly chew in one day. What five things absolutely must be done for you leave work today. Then honor that list. 4) Honor the System – Now that you have a system in place, fill this instead of using sticky notes or pieces of paper. Keep it up to date and filled so you only have one place that all of this lives and you know where everything you need to do is at. 5) Prioritize – Once you have this system, prioritize what’s important to you. For example, I’ll do first anything that revenue related that can make me money. Or maybe, it’s shutting the list off by a certain time to get home to family. Whatever your priorities, make sure you know them, set them and keep them. If you don’t set your own priorities, no one else will set them for you but everyone will expect to be one. Filed under: Being Human, How To Communicate.